Lord Vetinari is dead, either that or he’s on holiday. While the cat is away the mice come out to play – you being one of the mice. You will be given a secret personality which will tell you what you need to do to win the game. If you are one of the three lords then you must control a certain number of areas (the number depending on how many players are in the game). If you are Vetinari (having secretly returned to the city) then you must have minions placed in nine different areas. If you are Chrysophrase the troll then you must accumulate $50 in wealth, which includes the value of buildings on the board. If you are Dragon King of Arms then you want to cause enough trouble to lead the city to welcome back the rightful king. Finally, if you are Sam Vimes then you want to stop any other player winning by the time the deck of cards run out. Each player has a set of minions to do their dirty work and some building pieces. Game play is simple, you play a card and do what it says on it. Cards represent characters and buildings from the books, with each one being designed carefully to reflect the nature of the original character/building. Thus, if you play CMOT Dibbler then you may make money or lose it, depending on the roll of the die. Detritus would let you sort out trouble in the city, while playing a wizard would lead to the drawing of a random event card. This being Ankh-Morpork there are no good random events, just gradations of bad. There are also many assassins to allow you remove other players’ minions. Trouble is central to the working of the game. When a minion is added to an area that already has one or more minions in it then a trouble marker is also placed there. Conversely, when a minion is removed from an area any trouble marker there is also removed. Trouble markers allow players to remove minions by the play of cards, they also stop you from building in the area. Building in an area will give you an additional power, depending on the area you build in. A building in the Shades allows you to place an extra trouble marker each turn. A building in Small Gods will protect you from random events, as long as you have enough money to pay to your god! The game ends either when a player achieves his or her special victory condition at the beginning of their turn, or when the deck of cards runs out. If at this point nobody wins due to being Vimes then points are calculated, based on wealth and the number of minions on the board. Ankh-Morpork captures the world of Terry Pratchett in a light, chaotic game interwoven with brilliant theme. As a fan of the fiction, the game does what it set out to do. As a fan of board games, the game embodies the theme almost to a fault. If you are a gamer who considers Settlers of Catan or Robo Rally to be deep, then yes, Ankh-Morpork is deep. Like Settlers and Robo Rally the game play has strategic decisions to be made, but a chaotic element is central to game play. “Luck” is both your friend and enemy in these types of games. In Settlers you have the dice that may keep you from ever collecting resources from a 6 or 8. In Robo Rally the chaos is in the secret movement selection that causes downright chaos. Like in Robo Rally (but not in Settlers,) the chaos is central to Ankh-Morporks theme. In Ankh-Morpork, this is done through the cards you draw. If you are the type of gamer who considers the above mentioned games to be “light” and finds “deep” strategy in games like Hansa Tuetonica, Through the Ages and Puerto Rico then you will undoubtedly find this game light. That being said, it does scratch the itch quite nicely. Some games that suffer from chaotic card draw or dice rolling are really just suffering from ill-conceived mechanics. For some, this “luck” element isn’t something they are willing to look past. For some others, a game being controlled almost entirely by luck is exactly what they are looking for. These are not avid strategy gamers. Still, others find luck acceptable as long as it is well founded in the game’s theme or mechanics. Ankh-Morpork, is exactly that. A game where the luck/chaos is central to the game’s theme. If you haven’t read any of the Discworld books this may be hard for you to understand. But trust me, in a world full of wizards killing each other for one shoes, randomness is the name of the game. Discworld: Ankh-Morpork is a good game. It is full of strategic thinking mixed with theme-driven chaos. The components are top notch and the art rivals some of the best in the industry. Who should own this game? Anyone who’s looking for a light strategy game with a great theme and amazing artwork, and who doesn’t mind getting totally screwed by bad card draws and dice rolls as long as the chaos is theme-driven. Ankh Morpork is an area control game set in the Diskworld universe greated by Terry Pratchett. Simple rules, beautiful components and reasonable gameplay time makes it a very easily approachable game, suitable for experienced gamers and newbies alike (2-4 players – scales very well). Players randomly pick a secret identity (each has other goals), draw 5 cards and take turns to play one from their hand (sometimes more is allowed). These can allow to place agents, remove agents, gain money, build or do other described stuff. In addition some of the cards trigger special, random events. The game continues until somebody reaches their objective or the card deck runs out (points for agents, building and money are used to determine the winner). Lots. The hidden identities are entertaining and its often worth to mislead others even if it means you’re not marching towards victory as fast as you could. The level of interaction well balanced as well. On top of that there’s the hilarious theme – I’m a longtime Pratchett fan, so can’t say if everybody would get it, but I can only assume so. There’s quite some randomness involved – not as much as to make the game less fun, but enough to frustrate more competitive players. Also, in the 4 player game, after the group gains some experience, its very difficult to win before the deck runs out. This means one of the characters (Vimes) wins more much more often. We now drop him for 4 player games. Light theme, easy to grasp rules – Ankh Morpork makes for a great gateway game and can be pretty entertaining for more experienced gamers too. I didn’t know any lore in Discworld before this game. However, once I saw the enormous amount of characters displayed in this game, and the engagement of the other players who knew Discworld, I started reading. Now I appreciate this game even further. So, to the game! A small note though: I’ve only played the deluxe version, so component wise I’m really impressed. The regular version contains a smaller board and wood components. Each player starts with a hand of 5 cards each. These cards all have unique art on them, usually representing a character or more from the Discworld series. These are all great-looking. The cards serve one purpose: to perform one action. Above the portrait, you may find different symbols representing actions. The kind of actions are limited, but all players also receive a sturdy handout for quick referense, in case something is unclear. Every turn you must perform an action by playing a card. Play it, and draw until you have 5 cards. Then it’s the next players turn. Some cards have special text which allow for other cards to be played, steal something, force upon and many more other actions. – Place at least one minion in X different areas. – Have control over X different areas. – Have trouble markers in X different areas. – Have a total value of 50 in gold and buildings. – The draw pile goes empty. There are a couple of copies of the first one, only different names. These are shuffled and dealed out, so you never know what win conditions are in play, only your own. If the condition is met at the start of your turn, you flip over your role card and declare yourself a winner. All of these roles are stated on the handout, so everyone has a chance to make sure no others get close to their goal. The game is as simple as playing a card, placing a figure, and waiting for the next turn. The variations on the card makes for a different feel every time, and also adds to the varied gameplay throughout the game. It’s very unpredictable, and a lot can happen before your next turn. Luck is a big factor in the game, but that is also a good thing as a game for beginners, or those who want a light session. Thumbs up! Discworld is a beautifully thematic game that has quickly shot to the top of my favorites list. It has all the elements I love in a game: 2-4 players (equally fun at any number), deep, easy to learn, plays in an hour or less, and well integrated theme. The game is based on the Discworld novels, which I’ve never read, but now wish to do. The world seems to be a mix of Victorian Steampunk mixed with some fantasy elements. In a way, it reminds me of the underground in*boy. The premise is that there’s political chaos (and therefore, opportunity) on Discworld. Each player is vying to become the next leader. Here’s where the first cool feature comes into play: Each player has a secret victory condition. This feature works really well and it’s a great layer to distinguish novice players from experienced players. As you play, you’ll get better at making your opponents think you’re trying to win with Variant A when really you’re going for Variant B. Ultimately, the game is a worker placement/area control game. Each turn, you play at least one card and choose which options you want to do. Options include things like adding a new minion to the board, moving minions, drawing more cards, gaining money, etc. The iconography on the card is beautifully simple and is a great lesson for aspiring designers to note. You choose which options you want to take, which means you have great choices. You can also buy buildings, which grant you the ability for that region. The best players know how to wield their cards (randomly acquired) and abilities (guaranteed) to hinder their opponents and attain victory. The game is incredibly easy to learn. The components, including the outstanding art on cards, interesting meeples, and beautifully drawn board, are top notch. The game is great for experienced and new gamers alike. It has a good mix of strategy and randomness and all of my friends have enjoyed this so far. Give it a look, I don’t think you’ll be disappointed. Discworld: Ankh-Morpork, the board game based on the most infamous city in British author Terry Pratchett’s Diskworld series, combines a style-of-play and aesthetic old fans of the franchise will respect and appreciate, while—at its core—being a very playable strategy game for all. Secret victory conditions are distributed among the players, and while all seven methods of victory are known to everyone playing, only a maximum of four will be in play (when playing with four players). Alternative win conditions force players to attend not only to one’s own plots and plans, but also the actions of your rivals. This is not a game of sweeping attacks. Removing an opponent’s piece can actually be very tricky, requiring assassination (and even then requiring there to already be ‘trouble’ in that area of the city). Despite this appearance of simplicity, the game has hidden subtlety tied to how actions are taken each turn. Actions are played using character cards, from a limited hand. Players familiar with deck-building games will recognize abilities such as “play another card after this one” or effects that draw additional cards. These cards also control placing minions, obtaining coin, and building houses. Card abilities are themed around the characters they portray, a little treat for fans of Pratchett books. Death (a popular character in the books) assassinates two targets and builds a house—an in-joke fans will certainly get. All said, the game has dimensions of play, is strategic while remaining light, and is as playable with a dedicated gaming crew as with the family. A+! I’ll start right away with the fact that this is the game that my group plays the most. It is always fun, we laugh and we always have a good time! The game has a lovely assymetrical system – every player draws a Hidden personality card and has a unique goal written on it. The game goes on until somebody declares he or she’s the winner. When people see the name Martin Wallace on the box and then read the rules, they come back to check the name again. This game has two pages of intuitive rules and I think couldn’t be any simpler. Players have 5 cards in their hands. They use the to place, move or remove pieces on the 12 areas on the board. The pieces are Minions, Buildings and Trouble markers. You play your cards, than draw back up to five new ones. It’s the Pratchett universe. The game comes with a ton of cards, every single one of them representing a different Pratchett character. And they all do things that make sense! The theme is very very strong and I absolutely love the design. However, though being thematical and interesting, the mechanics are simple to understand and players who are not familiar with the city of Ankh-Morpork can enjoy the game just as much as the Pratchett fans. It really works wonderfully. Beautiful art on the cards, amazing quality and cute little custom meeples for the minions and buildings. Can’s say a single bad thing about them. Fast, easy and unpredictable. This is definetely not the game for the strategy generals who want to plan every move three turns ahead. This game features a lot of random effects and you can never know what will happen next turn. That being said, it still has a lot of strategy and you are not depandeble only on the dice and cards. If you’re good at the game, you will win most of the time. No two games could be the same. Once you learn all the cards by heart, you don’t get bored, but instead you get more tactical with them. I don’t see lack of replayability ever being an issue. As I said in the description – this is our favourite game. It’s relatively short (usually ~60min), easy to teach and learn, easy to understand, and always fun. We’ve never had a single game go wrong or bad for anybody. If you win – great! If you lose – great, somebody outwitted you and it was really fantastic experiance! This game allowed me to see parts of my friends that I’ve never seen before. People scheme and lie looking you in the eye with no remorse. Yes, the game might be too random at times and there are situation (I’d say one in every 6-7 games) where you are stuck with bad cards and there’s nothing you could do. But this doesn’t take away from the fun. I’d honestly change nothing about this game even if I had the chance. Final verdict: strongly recommended. I think this game deserves a spot on every shelf. Setting up Ankh Morpork floods a table with colour and character. The wooden components are tactile and vibrant and the artwork, which will be familiar to those who have read any Discworld novels, often leads to players ignoring the game and gleefully examining their hand of cards. It makes a great first impression. This is further strengthened by the simplicity of gameplay. On your turn you play a card and do the actions it provides. These actions allow you to manipulate pieces on the board and steer the conditions towards your secret objective, or away from your opponents’. Perhaps you are trying to control a certain number of areas, or have minions all over the board or maybe you just want money or to cause trouble. You can’t know for sure what your opponents are doing but you are always aware of the ways they might win. To succeed in Ankh Morpork, you have to be observant and devious, hiding your plans for as long as possible while picking apart the manoeuvres of your opponents. The multi-layered nature of the tactics required, coupled with how easy it is to play the game made it an excellent starter for my gaming group and, as such, it’s still a firm favourite. The game does, however, become a little frustrating over time. Firstly, one of the secret objectives is much easier to complete than the others, to the point where we have removed it from our games. The ‘Commander Vimes’ objective requires only that the deck runs out (the game ends) with no one else winning. There is no direct way to combat this (you can’t return cards to the deck) and so a player in possession of this objective does not need to hide very well and can spend the game blocking everyone else. After several plays, you will also become very familiar with the other objectives, making it increasingly difficult to meet your goals as everyone else will shut down anything that could lead to a victory, whether that was your actual aim or not. Most of our games now end with the winner decided on points gained from money and pieces on the board rather than a completed objective. I still enjoy Ankh Morpork and it continues to help me introduce my friends to gaming. My group’s over familiarity with the objectives does frustrate me sometimes as I come tantalisingly close to winning only to have it snatched from me simply because my friends habitually remove the minions of players who have too many pieces on the board. On the other hand, winning through your objective is all the sweeter nowadays. Ankh Morpork is a good looking game that is easy to play, easy to teach and fun despite its short comings. Discworld! Discworld! Party time! Excellent! Woo-woo-woo-woo! Oh, c’mon, Death, it’s a fun little culture reference, it’s all in good fun! IT IS UNDIGNIFIED. REVIEWING A GAME NEEDS NO GIMMICKS. BESIDES, I HAVE NEVER MET AN AUDIENCE WHO WOULD ENJOY AN EXTREME CLOSE UP OF ME. Um, fair enough. We’ll just move on, shall we? Ok, then. Well, anyways, let’s talk a bit about Discworld. Discworld is a most interesting place; a fantasy setting in which the world is flat instead of round, and balances on the backs of four elephants, which in turn all stand on top of a giant turtle drifting in space. And no, I am not kidding. It sounds like a strange concept (and it is), but this world, delightfully invented by Terry Pratchett, is among one of the most beloved and wonderfully detailed universes in all of fantasy literature. There have been video games, movies, and animated films based off of Mr. Pratchett’s related works, so why not board games as well? Enter this particular game. One of two board games based off of the Discworld series, Discworld: Ankh-Morpork takes place in the very same city for which it is named. The patrician of the city, Lord Vetinari, has gone missing, leaving a vacuum of power in the city that some enterprising powerful figures wish to fill. There are six individuals that seek to take control of the city…or are there? For Lord Vetinari may not actually be gone…he is the seventh individual looking to control the city, using the confusion to permanently consolidate his power base. The other individuals are Lord De Worde, Lord Rust, Lord Selachii, Chrysoprase Dragon King of Arms, and Commander Vimes of the Watch. Each seeks to take over the city in different ways, although in Vimes’s case, he just want to keep the peace; he has no interest in actually controlling the city for personal reasons. The game itself is surprisingly simple to play. To begin the game, each player selects one of the seven hidden Personality cards at random to determine who they are and what their win condition will be. Then, each player selects a color to play and selects all the colored game pieces that correspond to that color. The individual game pieces are minions (classic meeples) and buildings; there are other community pieces like trouble markers, troll figures, and demon figures. Next, all players collect ten Ankh-Morpork dollars to use for varying costs xuring the game. The Discworld board is a pretty simple affair. There are twelve areas of the board, each denoting key properties of Ankh-Morpork. Each of these properties has a price listing (to build a building on the property) and a number for the property; on occasion, players will have to roll a twelve-sided die for random effects, some of which include various parts on Ankh-Morpork. To start the game, all players place a starting minion in the areas on The Shades, The Scours, and Dolly Sisters. One trouble marker is also placed on those areas to start the game. The game is played essentially as a card game; everything that happens during the game is dictated by the cards that players ay during their turn. Each player has a hand size of five cards, and during their turn, they play a single card, then draw up to their maximum hand size at the end of the turn. The card that a player plays will usually have one or more effects on the card, and those effect are to gain money, place a minion on the board, place a building on the board, assassinate a minion, remove a trouble marker, scroll (perform the written instructions in the text area of the card), draw a random event card, play another card from your hand, or play as an interrupt. The effects are resolved in left-to-right order on the card as they are printed, but with the exception of the random event, all the effects are optional, and do not need to be resolved if the player doesn’t wish to do them, or in some cases, can’t legally do them. So what do trouble markers do? Well, they indicate strife, usually caused when two or more rival minions are in the same location. Placing a minion on the board in the same area as an opponent’s minion places a trouble marker in that area, but placing a minion in an empty area or a friendly area will not cause a trouble marker to appear. Some Personalities (like Dragon King of Arms) will win the game if a number of trouble markers are on the board. Also, buildings can’t be built on an area with a trouble marker. So how do you get rid of them? Assassination, usually. AH, THAT’S MY CUE. THERE IS A LOT OF KILLING IN THIS GAME. NASTY BUSINESS, BUT WHAT MORTALS DO ON THEIR OWN TIME IS THEIR OWN AFFAIR. WHEN ASSASSINATION HAPPENS, THE TROUBLE MARKER ON AN AREA IS REMOVED. A PLAYER CAN’T ASSASSINATE A MINION UNLESS THERE IS A TROUBLE MARKER ON THE AREA OF THE MION TO BE KILLED. You might also ask, what do the buildings do? Well, they count for cash for the purposes of Chrysoprase’s victory condition, but for everyone else, buildings allow the owner of the building to use the property power listed on the location. Each property can do something special once per turn, such as producing trouble markers, removing trouble markers, making money, or ignore random events. So how does the game end? If a victory condition is satisfied and is still in effect of the start of that player’s next turn, that player reveals their Personality card and wins the game. If no one has won the game by the time the draw deck has been depleted completely, then Commander Vimes wins the game if he is one of the Personalities in play. If he is not, then the player with the most points (minions on the board = 5 points each, buildings = their cost in points, $ = 1point for each dollar, -15 for not paying off Dent or Bank card if played) will win the game. Once you understand what the cards do and how they are played, Discworld plays fairly quickly. I have not had a game last longer than 40 minutes, even with novice players. But that hardly takes away from the experience of the game. 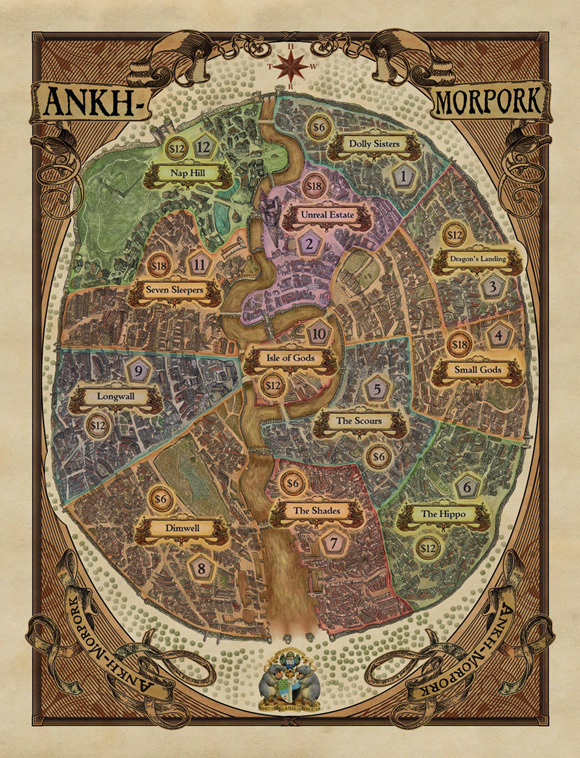 Anyone who has read the Discworld novels knows that Ankh-Morpork is a chaotic place, and the game reflects this nature, with the potential for a lot of things happening in a single turn, with everything from earthquakes to a dragon appearing happening in the game. What strikes me about the game is how neat and tidy it is. The artwork is very detailed and entertaining, the board is small and simple, and all the cards are easy to find and manage. The characters are quite current, including Moist and Reacher Gilt from Going Postal, but nothing after that…perhaps an expanion is in order? Oh, yes. Almost forgot. Death even has his own card, and is the only card in the game that can assassinate twice with one play of the card. Which makes him a very powerful card indeed. AND A VERY NICE LIKENESS ON THE CARD AS WELL. THE ARTIST CAPTURED MY GOOD SIDE. INSOFAR AS I HAVE A GOOD SIDE, THAT IS. Indeed, indeed. I should say that I am a bit biased in my review; I adore the Discworld series, and follow the material with a passion. But this game is a nice little package, not too complicated, but engrossing enough to provide amusing entertainment. The only detriment I can see to this game is that with only seven personality cards, it is easy to guess who a player is by their actions, and move to stop them. But I have the hope that additional Personality cards will solve this issue in the future. In the meantime, though, this is a good, solid game that shouldn’t be overlooked. Try it sometime! Can be hard to win at times but a very fun game with easy to understand goals and mechanics. If your a fan you should love it, other wise it would still be fun but not as great(because you have no idea who anyone is and why they do what they do). 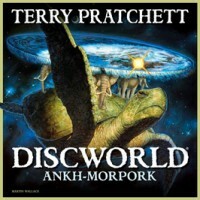 Add a Review for "Discworld: Ankh-Morpork"